Base on my investigation, Buhari and some Northern Elders has ordered Nnamdi Kanu and other Biafrans to Be Assassinated. 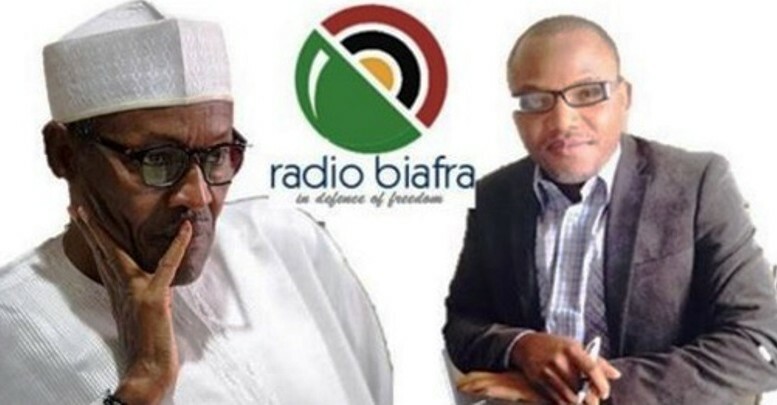 Muhammadu Buhari secret mission to assassinate the leader of the Indigenous People of Biafra (IPOB) and Director of Radio Biafra, Mazi Nnamdi Kanu the unshakeable and formidable leader who controls about 70 million Biafrans all over the world will be his greatest mistake. A prophet of our time where millions of Biafrans has pledge their life to the restoration of Biafra, therefore any attempt on Nnamdi Kanu's life is the pending doom for Nigeria. I quote this to the Tyrant and dictator Muhammad Buhari “ANY ATTACK ON MAZI NNAMDI KANU THE IPOB LEADER, IS AN ATTACK ON ABOUT 70 MILLION BIAFRANS”. Base on the analysis on pulverized, their plot is to eliminate the IPOB leader Mazi Nnamdi Kanu alongside with order Biafrans in various prisons. They also demanded for the head of the Deputy Senate President who they consider a sympathizer of IPOB, Ike Ekweremadu, Governor Nyesom Nwike of Rivers State Biafra Land and Ex Freedom Fighter Asari Dokubo. In a meeting with Buhari and Northern elders on 5th September 2016 in conjunction with some saboteur in Biafra Land Governor Rochas Okorocha of IMO STATE Biafra land and Willie Obiano of Anambra State all in agreement to eliminate the IPOB leader Mazi Nnamdi Kanu. Hell will let loose if anything should happen to the leader of A NEW AFRICA emerging world power, who is capable of development into actuality. Nnamdi Kanu a prisoner of conscience, the limitless freedom of a NEW AFRICA and NATION, the leader of the Indigenous People of Biafra who awaits to liberate the BLACK CONTINENT from mental slavery and poverty which the western world has kept the BLACK CONTINENT for centuries, in conjunction with the British Government who have been stealing and committing genocide act's in Nigeria for years now. Prophet Nnamdi Kanu must be released unconditional before another civil war will emerge because there will be no peace in Nigeria and the world at large should anything happen to Nnamdi Kanu. We are calling on Amnesty International, United Nations, Human Rights Watch and other human right groups to warn Buhari not to harm Nnamdi Kanu and other Biafrans still held in detention or else everything in Nigeria dies with immediate effect. Also the state security services (SSS) has outlined must wanted Biafrans who are expressing their Right to Self Determination Enshrined by United Nation Charter which the Islamic Republic of Nigeria is a signatory to. We call on lovers of freedom and people of good-will all over the world that nothing should happen to the above list of Biafrans and the leader of IPOB Mazi Nnamdi Kanu and Director of Radio Biafra / Biafra Television. Because there will be no peace for Nigeria, we Biafrans are scattered all the corners of the planet, this not a threat but a warning. CHUKWU OKIKE ABIAMA(The Creator) will bless lovers of freedom and people of good will all over the world. And mostly, CHUKWU OKIKE ABIAMA (the supreme creator of the universe) will guide and protect Biafrans all over the world. God bless Biafrans and Bless Biafra. All Hail Biafra. #FreeNnamdiKanu #FreeBiafra. let them try it and see the wrath of chukwu okike abiama on them.free nnamdi kanu free Biafrans.